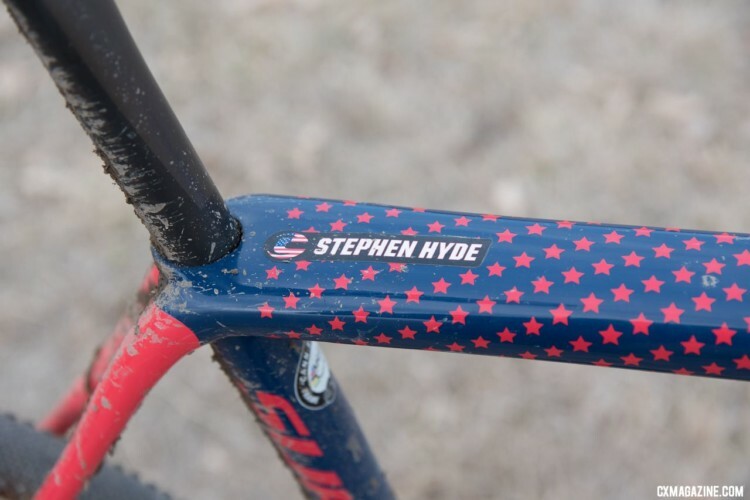 Stephen Hyde took the National Champion’s jersey in 2017, and Cannondale presented him with a special Stars and Stripes SuperX for the 2017 season. 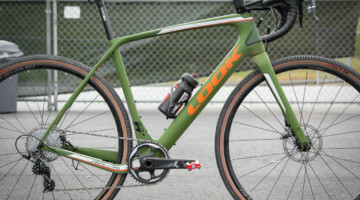 He piloted this bike to his Pan-American Champion jersey, in Europe with World Champion Wout Van Aert and in an epic battle with Jeremy Powers at the 2018 National Championship where he took his second consecutive title. 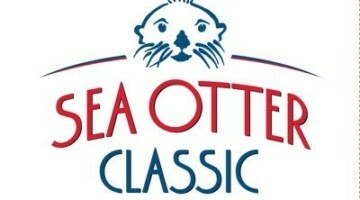 And for the second year in a row, Hyde escaped catastrophe despite the course’s toll on his equipment. 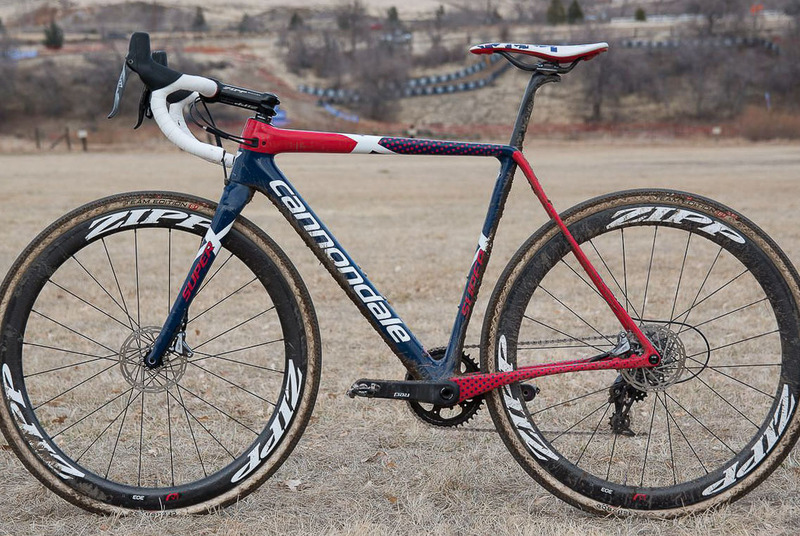 Hyde rides for Stu Thorne’s Cannondale p/b CyclocrossWorld team, and races the American brand’s top-level SuperX frame, outfitted with SRAM components, Zipp 303 Wheels and cockpit components. Cannondale has been producing the SuperX for years, but the current design is in its second year. 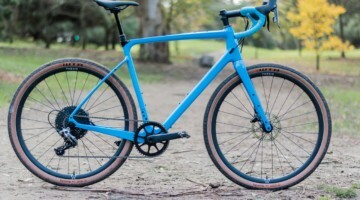 The geometry has been drastically redesigned from previous versions to cope with increasingly technical courses, using slightly shorter chainstays, but a longer, slacker head angle and a longer front center than most other cross bikes for a given size. 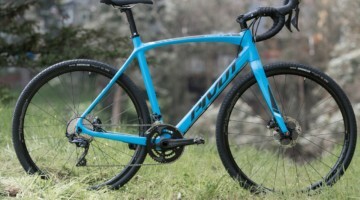 We reviewed the updated SuperX last year here. 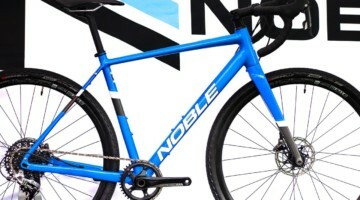 The bike is also unique in its asymmetric rear triangle which requires special dishing of the rear wheel in order to place the rim in line with the center of the frame. 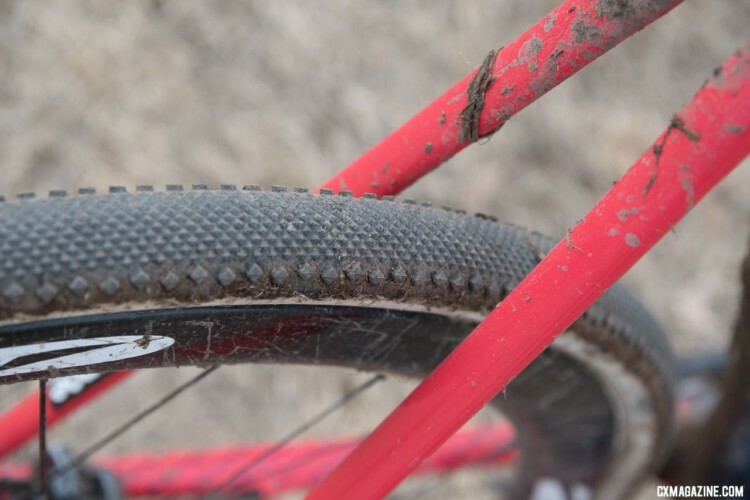 This was done to provide a better chainline when using a wide 142mm dropout. “Standard” rear wheels require a bit of re-dishing to work in the frame. Hyde’s frame features a unique Stars and Stripes paint scheme with personal touches just for the two-time champion. 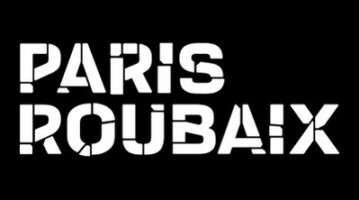 His signature can be found on the top tube behind the headset cap, with stars covering the top tube. 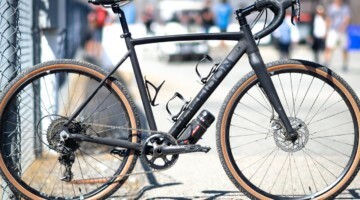 SRAM provides the Force 1 drivetrain on Hyde’s bike, using Force shifters and brakes, a Force CX1 rear derailleur, and a SRAM Red BB30 crankset with a single narrow-wide chainring. 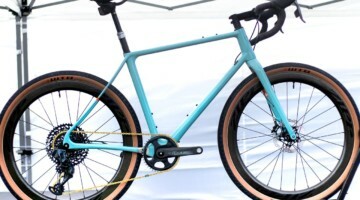 Hyde uses hydraulic disc brakes, which are nearly universal at the top level of racing (Jonathan Page being a notable exception). His Force HRD units offer reach adjustment at the lever and feature 18mm pistons in the caliper for stopping power. Hyde uses 140mm rotors. 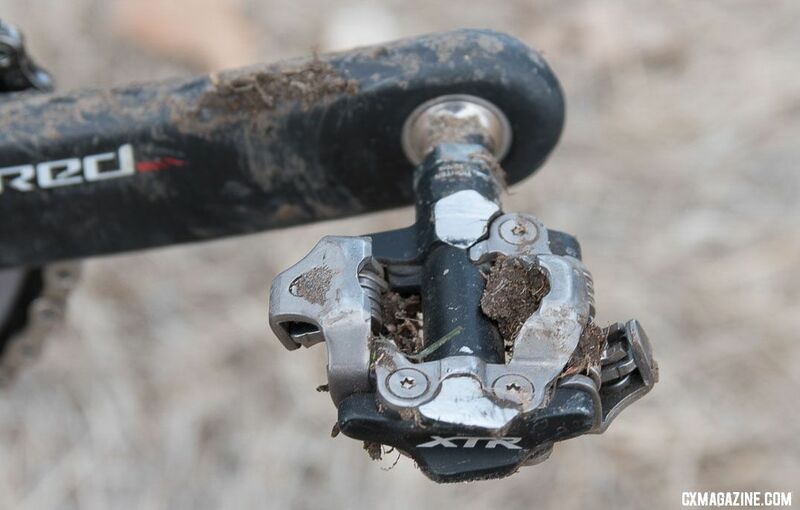 Paired with his shifter is a Force CX1 clutch derailleur, which, in concert with the narrow-wide chainring, minimises the possibility of chain drop, even on rough terrain. Like Most Cannondale frames, the SuperX uses some variant of the BB30 bottom bracket standard, and Hyde makes use of this feature with a SRAM Red BB30 crank, which is narrower at the spindle for greater heel clearance than the standard GXP offering and weighs about 50g less. 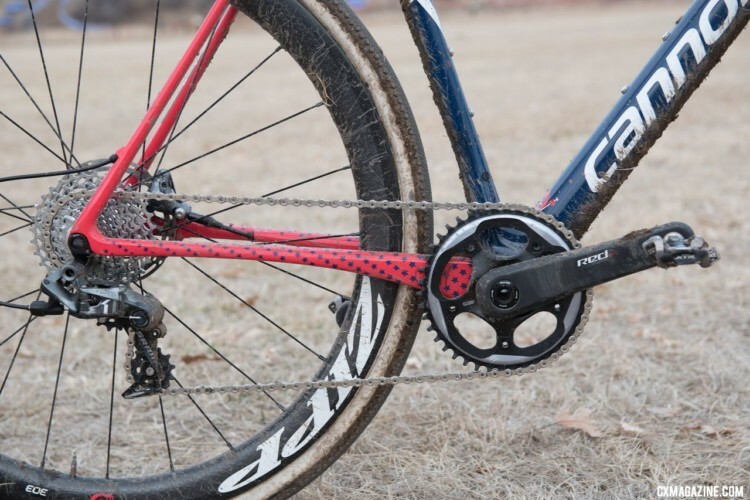 Hyde’s single chainring is a 42t SRAM X-SYNC chainring in 110 BCD, mounted with a traditional 5-bolt pattern to a removable spider on his crankset. 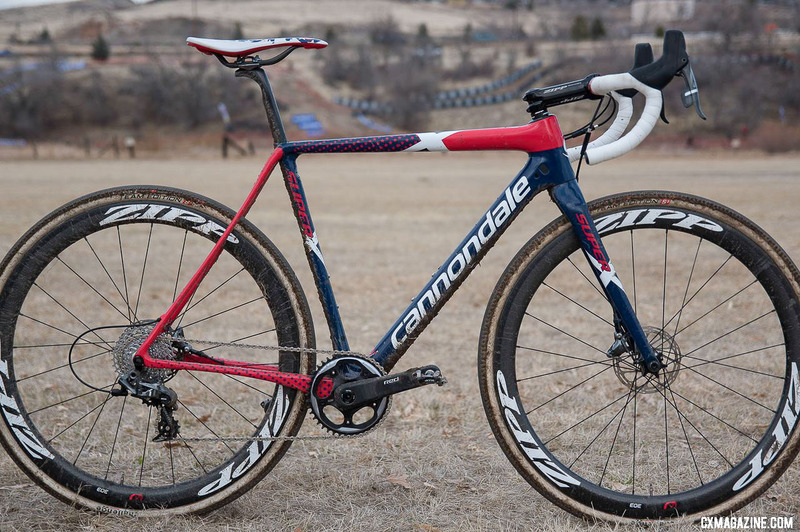 Riders on the Cannondale team are free to choose their own pedal system, and Hyde opted for Shimano XTR PD-M9000 SPD pedals. 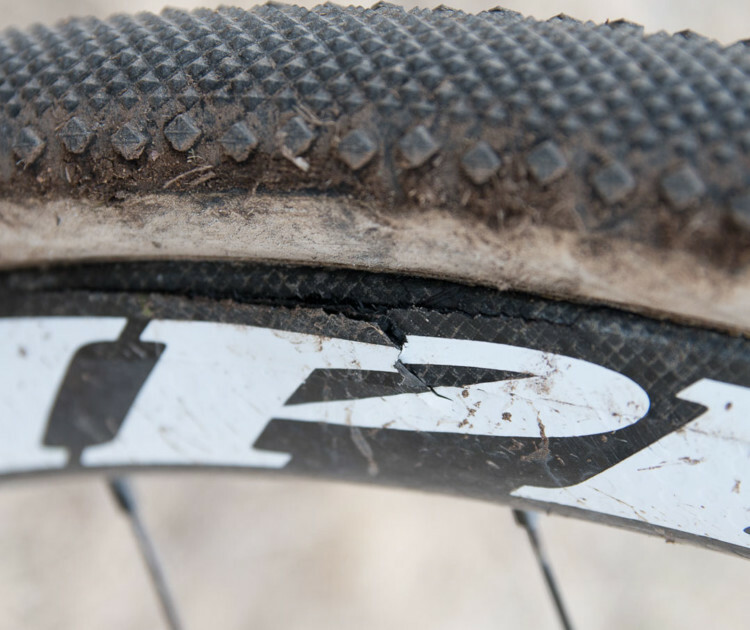 For the race, Hyde specifically used challenge team edition with the Dune file tread on his Zipp 303 Firecrest rims. Stu Thorne revealed Hyde was running 24psi up front and 24.5psi in the rear. He rolls on Zipp 303 Firecrest carbon tubulars with Challenge team edition handmade tubulars, the individual tread chosen for the course at hand. While others suffered flats this weekend, Hyde survived but still cracked his front rim during the race, possibly on the last lap as he descended the steep, hard packed and rock-strewn cambered descent. 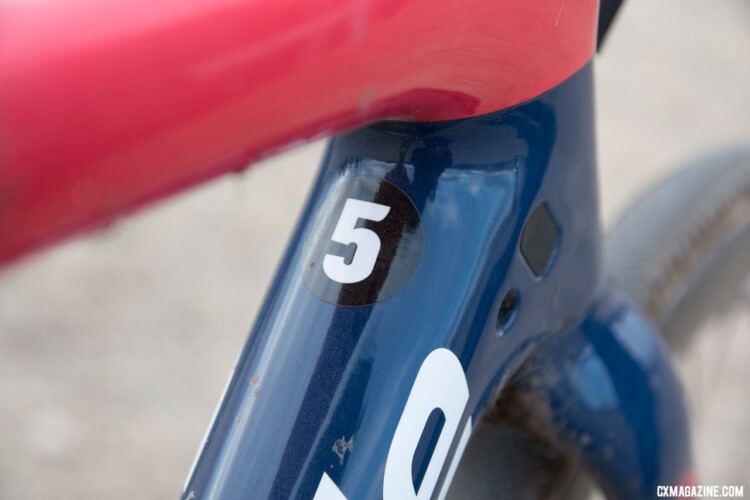 Hyde had five bikes in the team tent and he chose #5, though the build was the same for each we saw. His cassette is an 11-32 for the course, though he ran the hill every lap. We didn’t see an Elite ride the hill, although Rad Racing’s Calder Wood rode it much of the time in the Junior Men’s race, and his teammate Scott Funston swapped bikes to ride it in his final lap-chase of Ben Gomez Villafane. SRAM subsidiary Zipp provides much of the rest of the bike, his seatpost and saddle being the exception (his seatpost is a Cannondale SAVE carbon post in ø25.4mm and he uses a custom printed Stars and Stripes saddle from Fabric, which is another brand owned by Cannondale’s parent company Dorel). 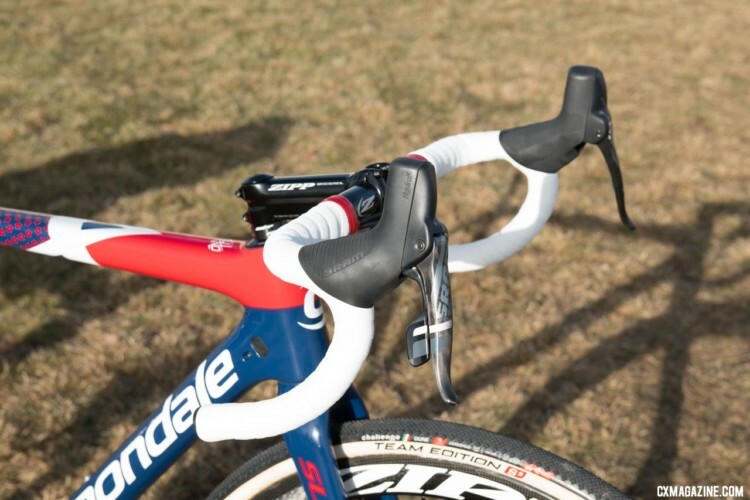 Hyde’s cockpit consists of an alloy Zipp Service Course SL stem and handlebar.